Nearly 4 dozen hand tied flies! These are all saltwater flies, mostly for striped bass fishing, generously donated by this club of serious fly tiers from Rhode Island. The collection comes in a large, Plano box. 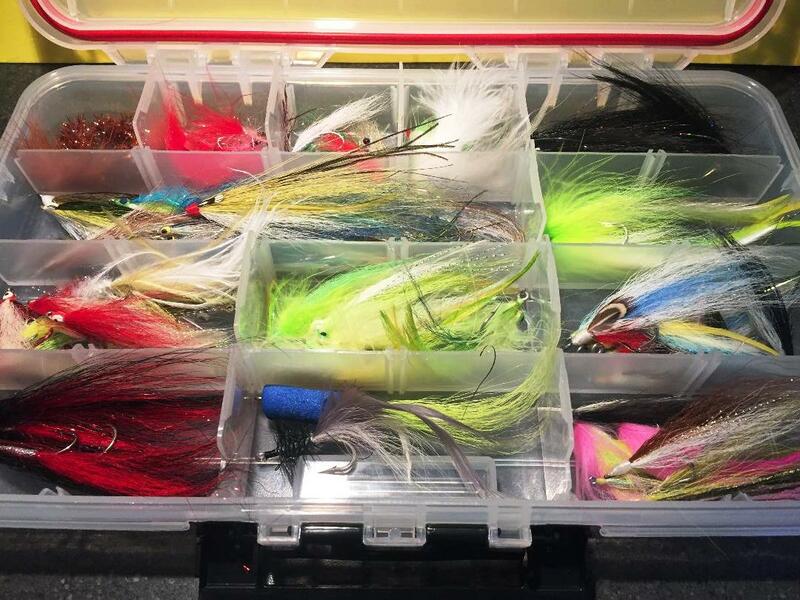 Because flies were contributed by many members we don’t have an exact inventory of the patterns, but I can see Clouser Minnows, Surface Sliders, Deceivers, Marabou patterns, bucktails etc etc. I’m sure every one of them is among the favorite flies of some very experienced fishermen. The United Fly Tyers of Rhode Island donated so many flies that we decided to make two auction items. Jeff Perry, the president of the club has split the flies in half and tossed in a second Plano box, so both Lot 1 and Lot 2 are more or less the same.